“Step outside your comfort zone” is a phrase that gets thrown around a lot, from trying new food to public speaking to (especially) studying abroad. Before I studied abroad, I thought I had stretched my comfort zone till there wasn’t much room to step outside of it anymore. I’d done it all: ballroom dancing classes, Ethiopian cuisine, cross-dressing for Shakespeare plays, improvisational comedy, the list goes on. I was excited to see another country and explore the culture, but I didn’t expect to encounter anything that would push my limits. But it didn’t take long for that to change. I found myself doing things that I wouldn’t have even considered back home. Sure I was uncomfortable (to say the least), but these experiences ended up being not only the defining moments of my time in New Zealand, but also truly life-changing moments (as clichéd as that sounds). When I started looking into what classes I could take in New Zealand, I decided it would be foolish not to take a Maori Studies course or two (Maori are New Zealand’s indigenous people). This would be my only chance to study in New Zealand, so I might as well take a class that I could only take there. The classes would be an interesting and fun way to get a few credits, but I wasn’t expecting too much out of them. That changed very quickly. My experiences with Maori culture started before I even made it to university. As part of the IFSA Butler orientation we traveled to a local marae (Maori meeting house) for a powhiri (traditional welcoming ceremony). As part of the ceremony two of us had to represent the group as ‘chiefs’. 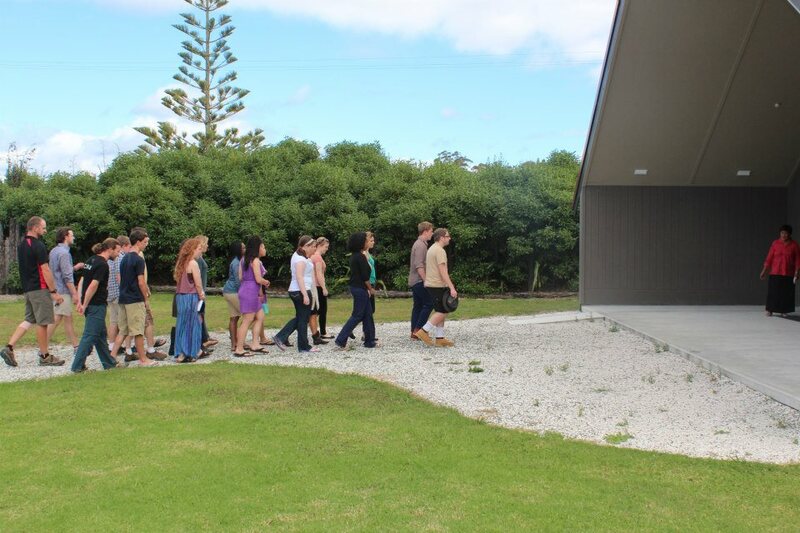 This meant leading the group into the marae and addressing the assembled Maori elders in Maori. One of the other students volunteered right away, but no one wanted to be the second chief. They were going to pick someone randomly if no one volunteered so feeling overly confident, I volunteered to be the second chief. The two of us were taken aside by the Maori presenter and each given a short speech to memorize and speak the next day. It was at this point I realized what I had gotten myself into. This wasn’t going to be like reciting lines in a play, this was going to be like performing a Shakespeare monologue in front of the playwright himself. It wasn’t just a corny welcome to New Zealand, I was going to participate in a greeting ritual that had been practiced for hundreds of years. My performance wasn’t just important because I wanted to sound good, I was stepping into another culture. To do a bad job was to compromise the integrity of the whole ritual and disrespect the elders I was addressing. Taking part in the powhiri gave me a sense of belonging. Something about being welcomed in a way that had true cultural significance made me feel at home in a way that a “Welcome to New Zealand” sign just couldn’t. But for as welcome as it made me feel, it was also an uncomfortable experience. Participating in the ceremony made me very aware of my own cultural location. Having to step into another culture in such an abrupt way helped me to see how I was projecting my own cultural assumptions and judgments onto my experiences. 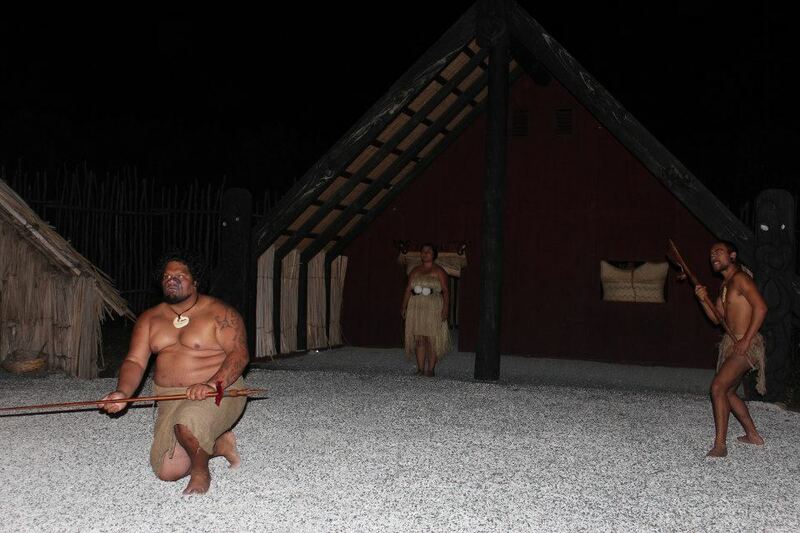 Being a part of the powhiri helped me to open up to Maori and New Zealand culture. When my Maori Studies classes started I was invested in them in a whole new way. I wanted to understand Maori culture, step back from my own cultural location and see things from the Maori perspective. In my Maori Society and Culture class I learned about Maori culture and mythology, their holistic worldview and the interconnectivity and sacredness of all things. I learned about modern Maori struggles to maintain their identity and sovereignty in the face of European and Kiwi rule. In my Maori Language class I started to understand the words I had spoken during orientation. They say language is the heart of any culture, and being able to speak Maori, even if it was poorly, immersed me in the culture in a way that would have been impossible any other way. I had class in the university marae every week, and had the opportunity to take part in another powhiri and a noho marae (overnight stay at a marae). Each week drew me deeper into Maori culture. I would have had a great time NZ if I hadn’t volunteered to represent my orientation group. I would have taken my Maori Studies courses and learned a lot. I would have thought highly of myself for being ‘cultured’ enough to not even have to step out of my comfort zone. But I found a way to push myself further, and in the process changed my whole experience in New Zealand. From that position of profound discomfort I was able to see how ignorant I really was and do something to change it. 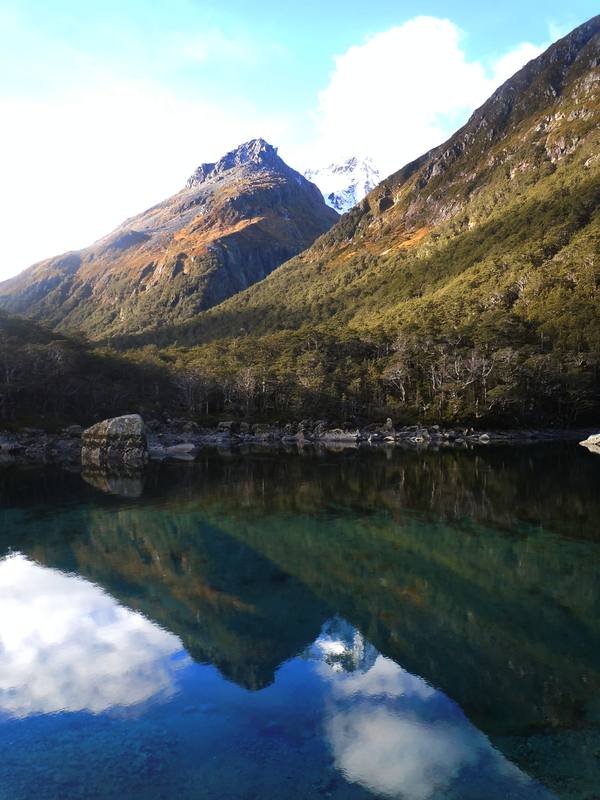 Backpacking alone around New Zealand was another out-of-my-comfort-zone experience. New Zealand is known for its natural beauty. You see pictures splashed all over National Geographic and the Discovery Channel, and Milford Sound is consistently listed as one of the most beautiful places in the world. I had backpacked occasionally in the US, and I decided that the best way to see New Zealand’s natural beauty was on foot with a pack on my back. Before I even arrived in New Zealand I already had an 8-10 day trip planned. The only problem was that when I got to New Zealand, it just so happened that none of the people in my program were keen on long backpacking (or ‘tramping’ as they call it in NZ) trips. So as the trip approached I had a choice: go by myself or change my plans. I was nervous about going alone, for safety and emotional reasons (that’s a long time to be alone), but I wasn’t going to compromise the one thing I came to New Zealand to do just because no one else wanted to do it with me. So I took off on my own. The trip ended up going extremely well. I shared the trail with several groups of Kiwis who I got to know and visited later in the semester. I also got to see a huge swath of beautiful New Zealand scenery. It went so well that it turned out to be the first of four solo tramping trips I would take. I had been really worried that tramping alone would turn out to be a miserable experience, but I found it to be the opposite. There was something much more fulfilling about tramping alone. With my palate whetted I decided I wanted to try tramping alone in a more remote area. So I planned a trip to Nelson Lakes National Park, a hidden gem in the middle of the South Island. Away from the tourist hubs, Nelson Lakes NP gets fewer visitors than most of the other National Parks. It was also the equivalent of November, so I wasn’t expecting to see many people. In fact, I didn’t see anyone. I went for three-and-a-half days without seeing another human being, and it was glorious. This ended up being, along with my Maori classes, the most important experience of my time in New Zealand. My trip took me from a remote village around the park entrance through beech forest and alpine tussock fields to Lake Rotoroa. That evening I sat at the end of a jetty and watched the sun set over the mountains reflecting off the lake. The next day I followed the Sabine River valley into the mountains in search of Blue Lake, the clearest fresh water in the world. As I walked the mountaintops began to pop out of the mist glowing in the sun. At one point I came upon a river gorge where the water deepens till it is possible to dive off the cliffs into the crystal clear water. It was so clear I could see a trout the size of my arm swimming at the bottom. 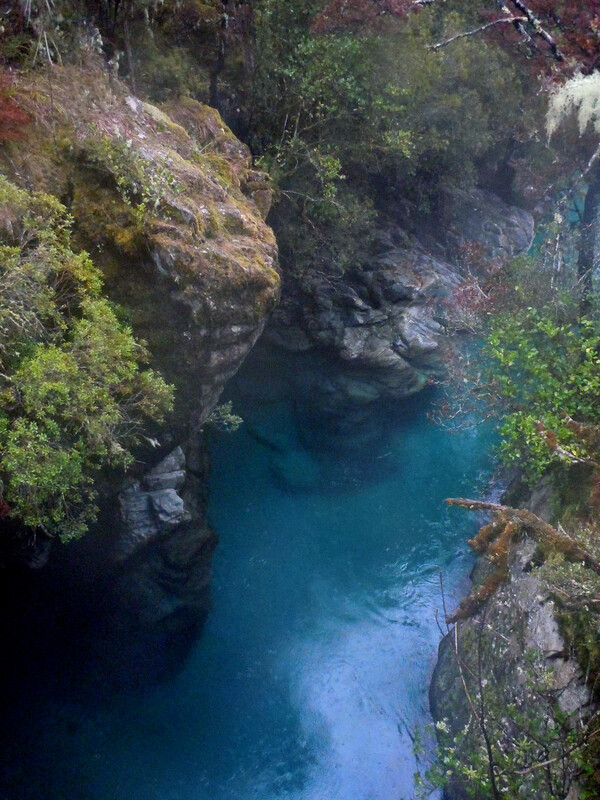 When I finally reached Blue Lake I found it exceeded even the high praise I had heard about it. I was surrounded by snow covered mountains silhouetted by the setting sun and reflected in the water. From any point along the lakeshore I could see straight to the bottom. As I walked around the lake I found a pair of endangered whio (blue ducks) calling to each other. The next morning I woke to a peachy sunrise over the mountains and said my goodbyes to Blue Lake before taking off back to the trailhead. The things I saw in Nelson Lakes NP would have been beautiful no matter how I saw them. They would have been beautiful if I had seen them with another person, been able to say, “this is the most beautiful place I have ever been,” and have my sentiment affirmed by someone else. But being alone that makes everything different. It makes it harder to only take in the superficial beauty of something; you are forced to immerse yourself in your surroundings. What is around you is the only company you have. You notice details you wouldn’t have seen before, hear things that would have been lost in your conversation. While backpacking I found this quote in a book and it really summed up the feeling nicely: “There is something very fascinating to me in the cry of a kea or the call of a Paradise duck to his mate. They seem to accentuate the hugeness of the mountains and the wide spaces of the great river-beds, which make you feel so small and solitary” (Glissading on Four Peaks by Jim Dennistoun). Being alone for that long also teaches you a lot about yourself. You don’t have the option to watch another YouTube video rather than think. In the same way that a foreign culture provides the chance to reexamine one’s own culture, solitude brings about a kind of introspection that just doesn’t happen any other way. I learned about what I care about, what I need to be happy, and what I can accomplish. Sure backpacking with someone else would have been more entertaining, and arguably more fun, but there is no way it could have been more meaningful. I never would have chosen to backpack alone if I had had the option to go with friends. But I was willing to try something new to see New Zealand the way I wanted to see it and I ended up getting more out of it than I ever could have imagined. Both my Maori cultural experiences and my time backpacking alone represented big steps outside my comfort zone. Both experiences came down to choices I made to do something new and difficult. Being open to feeling profoundly uncomfortable is the best thing you can do while studying abroad. Stepping out of your comfort zone brings about growth because it allows you to look back on where you were. What you get out of studying abroad is directly proportional to how far you are willing to push yourself beyond your comfort zone. Even if you think you’re quite proficient at trying new things, I guarantee you that studying abroad will offer you chances to go further. You may need to work at it, but the opportunities will be there, and they will be worth it. If you do not step outside of your comfort zone while you’re abroad, you’re not trying hard enough. Will Hoover is a student at Oberlin College and studied abroad with IFSA at Victoria University of Wellington in 2013.